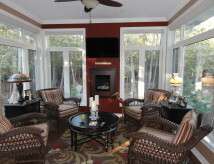 Relax in your sunroom. Enjoy the beautiful outdoors from the comfort of your own home, without the annoyance of insects, harmful U.V. rays or foul weather. We offer single, double, triple and high performance glazing options to suit the seasonal or all season enclosure Our all season sunrooms are insulated to keep you warm all winter long. Every Connor sunroom is designed to meet your specific needs. All Season Sunrooms from Connor Windows Ltd.